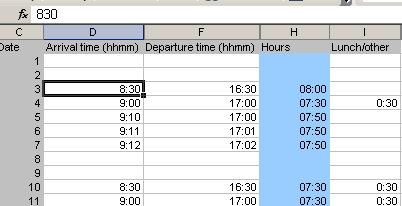 For a simple Excel sheet time reporting, i needed to enter hours every day for arrival and departure time. Excel is not so smart about the time format. For instance I need to enter “9:00” for nine in the morning. I wanted just to enter “900”, and let the excel sheet format the data correctly itself. 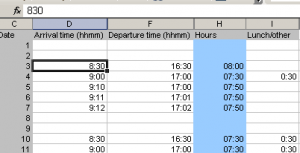 I found a working solution on PC Mag: “Easy Date and Time Entry in Excel Tips“. Enter time format as a simple number (like “900” or “1500”). 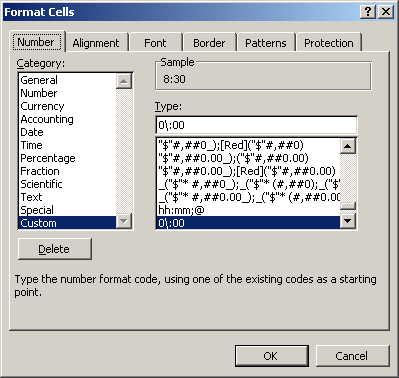 Format the cell to display an extra colon. In a (hidden?) cell, calculate the time to use for further calculations. 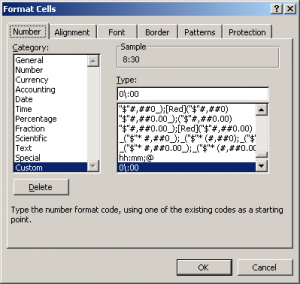 Take the cell and format it so it visually shows the colon for the number that is input. Go to the menu item “Format” > “Cells…” dialog. Select “Custom” format and input “0\:00” as shown on the screenshot. Take an adjacent cell and let it interpret the input value as a time value. =TIME(9, 15, 0) is equivalent to 09:15:00 and will require 3 parameters for hour, minutes, seconds. This calculation is hidden in the final spreadsheet in columns E, G, and J.
I added the time sheet template here for further convenience. This entry was posted by Jesper Rønn-Jensen	on Wednesday, January 5th, 2011 at 20:41 (GMT-1)	and is filed under office. You can follow any responses to this entry through the RSS 2.0 feed. Both comments and pings are currently closed. Updated the sum calculation. If it got to 24 hours it would continue from 00:00. The solution was to change the format of the sum field. New (custom) format “[h]:mm” solved the problem. what about a macro insert a “:” with a simple substring right 2 chars replace. in global.dot works in every sheets no hidden collums etc.